Dromana, a residential and seaside suburb on the Mornington Peninsula, faces Port Phillip Bay about 58 km south of Melbourne. The precise origin of the name is uncertain, except that it came from Dromana in County Down or the County of Waterford, Ireland. Dromana is situated between Arthurs Seat (where Andrew McCrae took up a pastoral run in 1844) and Safety Beach where Hugh Jamieson obtained a Special Survey property of eight square miles in 1841. Jamieson's property was also known as the Kangerong Basin, and it was later occupied by tenant farmers. Dromana's backdrop is Arthurs Seat, one of several prominent rises visible from Port Phillip Bay and named by Lieutenant John Murray when he explored the bay in 1802. A small rocky outcrop below Arthurs Seat was named Anthony's Nose by Superintendent La Trobe in 1840. It separates the McCrae and Dromana beaches. Latrobe Parade and Latrobe Reserve are nearby. Dromana emerged as the local point of settlement, a process that was invigorated with the building of a pier 1862. The preceding years had seen the opening of the Dromana Hotel (1857) and a local school (1860). The Flinders and Kangerong Road District (1862) and the subsequent shire (1874) built their offices in Dromana at the corner of Hodgkinson Street and Nepean Highway. When farmlands were cleared and occupied at Red Hill and Main Ridge produce and supplies were transported by boats which called at the Dromana Pier. Bay steamers brought visitors and tourists to Dromana. In 1871 W.B. Hearn, foundation Professor of Law at the University of Melbourne, built a country retreat at the foot of Arthurs Seat, Dromana West, naming it Heronswood. It symbolised the new leisure interest in the Mornington Peninsula, coinciding with George Coppin's development of Sorrento. Heronswood is on the Australian and the Victorian historic buildings registers. 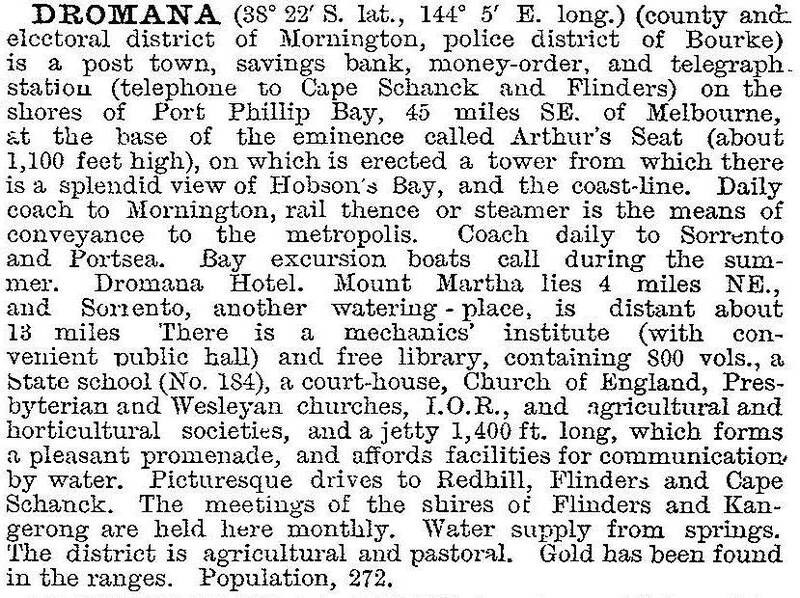 By the 1920s the increased car ownership put Dromana within easier reach of Melbourne. A Dromana Progress Association was formed and its secretary, an estate agent, vigorously marketed building allotments, some on a subdivided orchard. Dromana had several shops, more than one motor garage, a hospital and a local racecourse. For those who chose not to buy a block of land there was foreshore camping, and later there were private caravan parks. In 1939 a bushfire destroyed several buildings. During the early postwar years there was foreshore holiday camping from Dromana to Rye. By a combination of local traders' acumen and a slight advantage in position Rosebud came to outrank Dromana as the Mornington Peninsula's regional centre. The Flinders Shire's works depot was moved to Rosebud in 1966 and in 1976 so too were the shire offices. The old shire offices at Dromana have been converted to a local history museum. East of Dromana the racecourse site was divided between a technical school (1966) and a second recreation reserve. By the 1970s there was substantial housing built on the lower slopes of Arthurs Seat and Point Nepean Road suffered traffic congestion, particularly during holiday periods. The Mornington Peninsula Freeway was built, to some extent separating seaside Dromana from hillside Dromana. The Arthurs Seat State Park has preserved much of the hillside bushland, apart from a quarry on its eastern flank. Dromana has a shopping centre along Point Nepean Road opposite the pier, a slender foreshore reserve that widens into Latrobe Reserve, State primary (492 pupils, 2014) and secondary schools (1271 pupils, 2014), foreshore camping and caravan parks, a public golf course (Safety Beach), tennis courts and drive-in theatre (1961). In addition to the shopping centre near the pier, there is the Dromana recreation reserve, tennis courts and Anglican (1892), Catholic, Presbyterian and Uniting churches. East of the Freeway and the drive-in theatre there is rural Dromana and several vineyards. Near them there is Dromana secondary college (1988) which absorbed the technical school. On census night in 2011 46.5% of dwellings were unoccupied (ie mostly holiday houses).